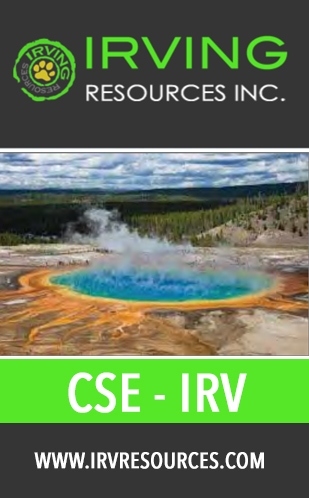 Vancouver, British Columbia, March 4, 2019 (TSX Venture: EMX; NYSE American: EMX) – EMX Royalty Corporation (the “Company” or “EMX”) is pleased to announce the execution of an exploration and option agreement (the “Agreement”) for the Røstvangen volcanogenic massive sulfide (“VMS”) property and Vakkerlien nickel-copper-cobalt property in Norway (collectively the “Project”) with Playfair Mining Ltd. (“Playfair”) (TSX Venture: PLY). The Agreement provides EMX with immediate share equity in Playfair, and upon Playfair’s completion of the option terms and other consideration, a 9.9% interest in Playfair, a 3% net smelter return (“NSR”) royalty on the Project, and advance royalty payments. The Røstvangen property hosts a >30 kilometer long trend of geophysical anomalies and VMS-type mineralization, as well as the Kvikne copper deposits, that occur in one of Norway’s oldest mining districts. On the directly adjoining Vakkerlien property, nickel mineralization was discovered in the 1870s, and was the subject of drill campaigns from the 1970s through the early 2000s that led to the discovery of nickel-copper-cobalt mineralization. On signing the Agreement, subject to TSX Venture Exchange acceptance, Playfair will issue to EMX 3 million common shares of Playfair stock. As a condition to the exercise of the option, Playfair must complete work commitments of at least $250,000 on the Project, and must raise such capital by May 15, 2019. 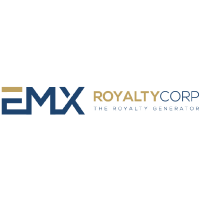 Upon exercise of the option, Playfair will issue to EMX an additional 3 million shares of Playfair stock, and EMX will receive a 3% NSR royalty on the properties comprising the Project. 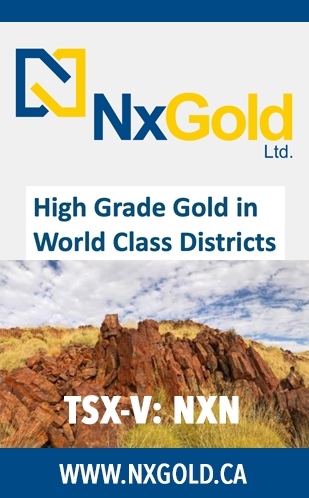 Within six years of the execution of the Agreement, Playfair may purchase 1% of the NSR royalty in 0.5% increments for a total of $3,000,000, leaving EMX with a 2.0% NSR royalty. EMX will also receive annual advance royalty (“AAR”) payments of $30,000 commencing on the second anniversary of the option exercise, with the AAR payments increasing by $5,000 per year until reaching $80,000 per year. AARs may be paid in cash or Playfair shares, subject to certain conditions. 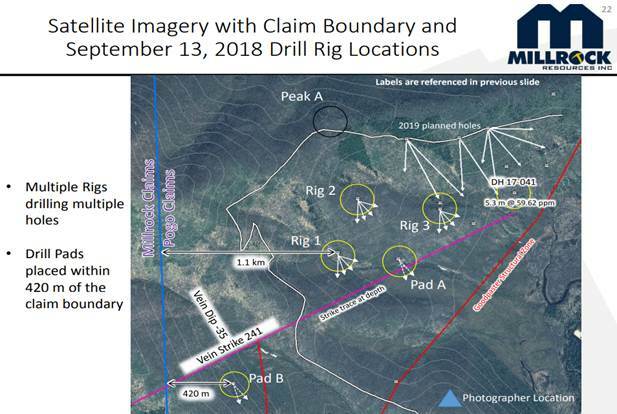 Playfair will use commercially reasonable efforts to raise an additional $2,750,000 for advancement of the Project and other activities, and will drill at least 2,000 meters on the Project before the third anniversary of the Agreement effective date. Within two years of the execution date, Playfair will issue to EMX that number of common shares of Playfair that will increase EMX’s equity ownership in Playfair to 9.9%. Thereafter, Playfair will have the continuing obligation to issue additional shares of Playfair to EMX to maintain its 9.9% interest in Playfair, at no additional cost to EMX, until Playfair has raised a cumulative $3,000,000 in equity; thereafter EMX will have the right to participate pro-rata in future financings at its own cost to maintain its 9.9% interest in Playfair. the fifth anniversary of the option exercise date. The issuance of additional shares of Playfair to EMX will be limited to a maximum 9.9% equity ownership in Playfair by EMX. The issuance of Playfair shares to EMX as set forth in the Agreement is subject to receipt of TSX Venture Exchange approval. Overview of Project. The Røstvangen property is located approximately 300 kilometers north of Oslo, and hosts the “Kvikne Copper Works”, one of Norway’s oldest base metal mining districts. Copper mineralization was discovered at Kvikne in 1629, followed by 150 years of mineral production. The mineralization at Kvikne is VMS-type, with enrichments of copper and gold. The Kvikne deposits are positioned along a >30 kilometer long trend of geophysical anomalies and VMS-type mineral occurrences that form multiple parallel belts across the property. These belts have seen little modern exploration work, and only a few historic drill holes, despite the widespread VMS occurrences and historic mining activities. The Vakkerlien nickel-copper-cobalt property directly adjoins the Røstvangen exploration licenses. Nickel was discovered on the property in the 1870s, when small scale mining was conducted in the district. 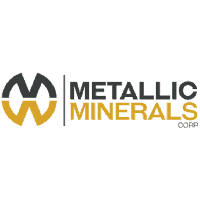 Further exploration by Falconbridge Limited and Blackstone Ventures Inc. from 1975 through the early 2000s led to the drilling and discovery of nickel-copper-cobalt mineralization to the southeast of the historic workings. The mineralization is associated with, and hosted by, a mid-Proterozoic gabbroic intrusive complex, and is interpreted to be a magmatic sulfide deposit type. Gold and platinum group element (“PGE”) content remains poorly understood and in need of further assessment. EMX and Playfair are planning to commence exploration programs in the upcoming spring and summer months, which will include property-scale sampling, reconnaissance mapping and geophysical surveys. The intent of the programs is to rapidly identify additional exploration targets for drill testing. This entry was posted in Base Metals, Energy, Junior Mining, Project Generators on March 4, 2019 by admin. VANCOUVER, British Columbia, Feb. 27, 2019 (GLOBE NEWSWIRE) — Riverside Resources Inc. (the “Company” or “Riverside”) (RRI.V) is pleased to announce that the Company has received exceptionally strong investor interest and intends to increase its previously announced non-brokered private placement (see press release February 13, 2019) by an additional $800,000. Riverside now plans to raise up to $2,300,000 in gross proceeds from the issuance of 14,375,000 units at a purchase price of $0.16, up from the original $1,500,000 target. Each unit consists of one common share and one whole common share purchase warrant (“Unit”). Each common share purchase warrant is exercisable into one common share for a period of two (2) years from closing at a price of $0.22 (“Warrant”). If, at any time after four months following the closing of the private placement, the closing price of the common shares on the TSX Venture Exchange (“TSX-V”) trades at a VWAP equal or greater than $0.45 for 10 consecutive trading days, the Company may accelerate the expiry date of the Warrants by disseminating a press release announcing the new expiry date whereupon the Warrants will expire on the 30th trading day after the date on which such press release is disseminated. Riverside is an exploration company driven by value generation and discovery. 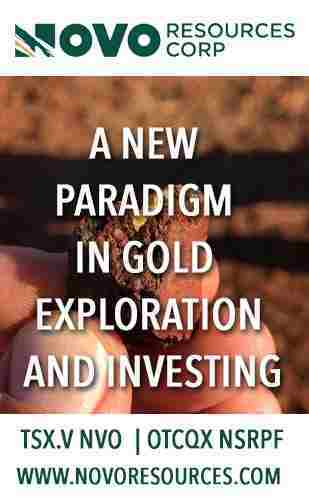 The Company has 45M shares issued and a strong portfolio of gold-silver and copper assets in North America. Riverside has extensive experience and knowledge operating in Mexico and leverages its large database to generate a portfolio of prospective mineral properties. In addition to Riverside’s own exploration spending, the Company also strives to diversify risk by securing joint-venture and spin-out partnerships to advance multiple assets simultaneously and create more chances for discovery. Riverside has additional properties available for option, with more information available on the Company’s website at www.rivres.com. Certain statements in this press release may be considered forward-looking information. These statements can be identified by the use of forward looking terminology (e.g., “expect”, “estimates”, “intends”, “anticipates”, “believes”, “plans”). Such information involves known and unknown risks — including the availability of funds, the results of financing and exploration activities, the interpretation of exploration results and other geological data, or unanticipated costs and expenses and other risks identified by Riverside in its public securities filings that may cause actual events to differ materially from current expectations. Readers are cautioned not to place undue reliance on these forward-looking statements, which speak only as of the date of this press release. This entry was posted in Base Metals, Energy, Junior Mining, Project Generators on February 27, 2019 by admin. Vancouver, British Columbia–(Newsfile Corp. – February 21, 2019) – EMX Royalty Corporation (TSXV: EMX) (NYSE American: EMX) (the “Company” or “EMX”) is pleased to announce it has acquired ownership of 1,995,672 common shares (representing 2.63% of the outstanding shares) and warrants to purchase an additional 1,995,672 common shares of Boreal Metals Corp. (“Boreal“; TSX-V: BMX). 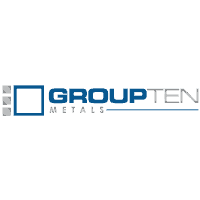 The acquisition was made pursuant to a private placement of units, each unit consisting of one common share and one warrant to purchase a further common share, at a price of $0.095 per unit (for a total investment of $189,589 by EMX), which closed today. Immediately prior to the acquisition, EMX had ownership of 5,530,063 common shares (representing 9.4% of Boreal’s outstanding common shares). Immediately following the acquisition, EMX had ownership of 7,525,735 common shares (representing 9.9% of Boreal’s outstanding common shares) and warrants to purchase an additional 1,995,672 common shares. If the warrants were exercised, EMX would have ownership of 9,521,407 common shares (representing 12.20% of Boreal’s outstanding common shares). EMX has filed an Early Warning Report with the British Columbia, Alberta and Ontario Securities Commissions in respect of the acquisition. Copies of the Report may be obtained from SEDAR (www.sedar.com) or without charge from EMX’s Corporate Secretary, Lori Pavle (604-688-6390). This entry was posted in Base Metals, Energy, Junior Mining, Project Generators on February 21, 2019 by admin. Gregory Beischer the President, Director, and CEO of Millrock Resources (TSX: MRO | OTC: MLRKF) along with Chris Van Treeck Senior Project Geologist sits down with Maurice Jackson of Proven and Probable to discuss a unique value proposition for current and prospective shareholders on the latest developments on MRO’s West Pogo – Goodpaster Project. 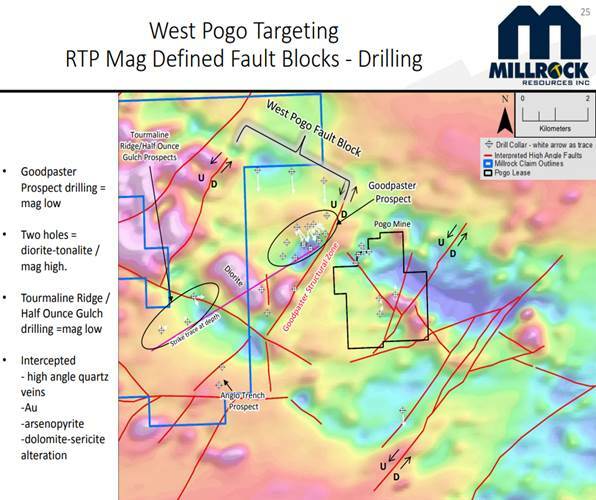 Today’s interview will be very comprehensive, as Senior Project Geologist Chris Van Treeck provides a thorough analysis of Nothern Star Resources Pogo Mine in relation to Millrock Resources adjacent 100% owned (7) claim blocks in the West Pogo – Goodpaster, in what may very likely be a watershed moment for Millrock Resources. 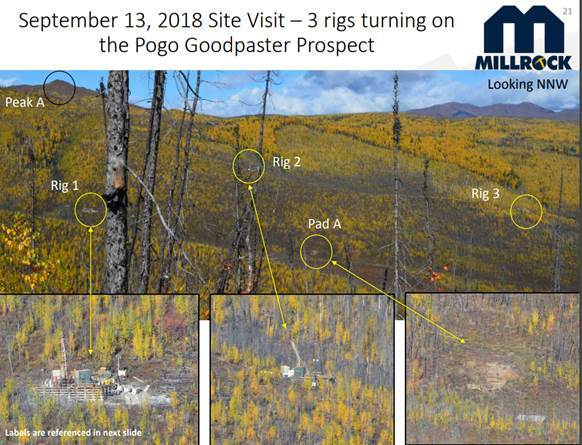 Gregory Beischer, the president, director and CEO of Millrock Resources, and Chris Van Treeck, the company’s senior geologist, speak to Maurice Jackson of Proven and Probable about their varied projects, and discuss what their next-door neighbor’s drilling in Alaska is finding. Maurice Jackson: Joining us for a conversation today is Gregory Beischer, the president, director and CEO of Millrock Resources Inc. (MRO:TSX.V; MLRKF:OTCQX), along with Chris Van Treeck, senior project geologist. Glad to have you both on the program to discuss an important announcement that may be quite significance for Millrock Resources. But before we begin, Mr. Beischer, for first time listeners, who is Millrock Resources? Gregory B: Millrock is a project generator company. Alaska is home base for a lot of us and so we explore there and we also explore in Sonora state in northwestern Mexico, as well as the state of New Mexico and the southwest U.S. At Millrock we come up with early-stage exploration projects and then we make agreements with other exploration and mining companies to share the risk that’s involved in early-stage drilling. And the whole objective is to keep a systematically exploring continuous early exploring company that over time will make big discoveries that drives up Millrock’s share price without continuously diluting shareholders as with most exploration companies. Maurice Jackson: Mr. Beischer, beginning in Mexico, please introduce us to the Millrock project portfolio. Gregory B: In Sonora state, which is the northwestern part of Mexico (click here to view), Millrock holds advanced exploration projects, primarily focusing on Orogenic gold deposits, of which Sonora hosts some great examples, such as the Herradura multimillion ounce, probably around 9 million ounces, one of which is Newmont’s leading mine. We are in the right part of the world to be looking for these large gold deposits. 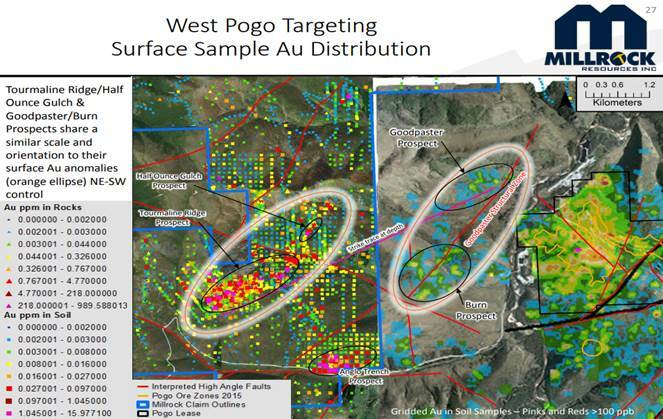 Additionally, we target copper there, in particular porphyry coppers like the world-class Cananea-La Caridad belt, just south of the Arizona porphyry belt, probably a southern extension of the same cluster of the porphyry deposit. So, we like these types of deposits that can be exceptionally large and great metal producers. We also explore in the state of New Mexico (click here to view), which is opened up as a much more open jurisdiction to mining. We acquired several years ago a uranium deposit in that state; we’ve sat on it to for these years without doing much work, biding our time until the uranium price improved. It turns out this year the uranium deposit also has a lot of vanadium in it, and potentially both metals could be mined together. We’re starting to get calls as people learned that we own this project. So, I’m pretty sure we’ll be able to make an agreement on it sometime soon. 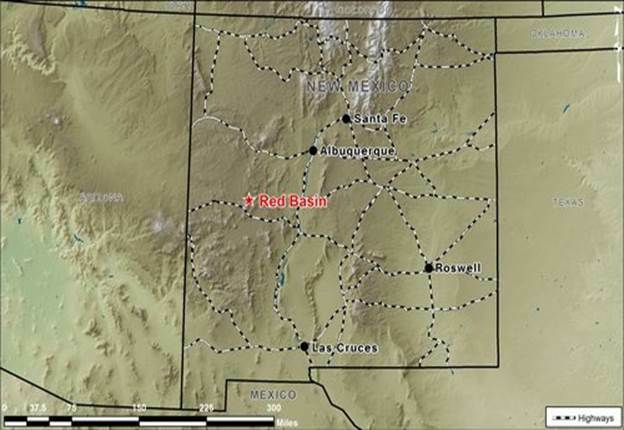 We also have a gold project in New Mexico and are lining up partners as we speak. But home base is Alaska, where we’ve got quite a number of gold and copper projects that have active exploration ongoing right now. Maurice Jackson: And, gentlemen, let’s stay in Alaska, shall we? And, in particular, I want to focus on seven claim blocks owned by Millrock Resources, which may be direct beneficiaries regarding the press release issued on Feb. 12 by neighboring Northern Star Resources where it just released some exceptional exploration results on its Pogo gold mine. Chris, you are the senior project geologists on the Pogo West. 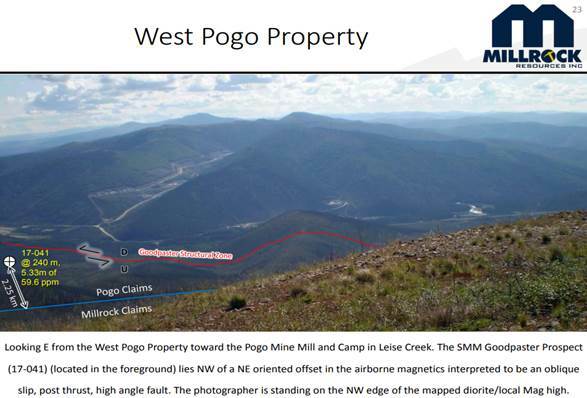 Please take us to the Pogo gold mine and show us where it is in relation to Millrock resources, Pogo West. 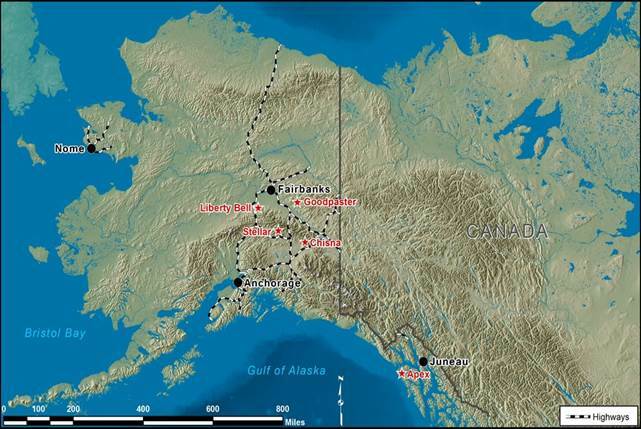 Chris Van T: We are going to be in interior Alaska right next to the Pogo mine. 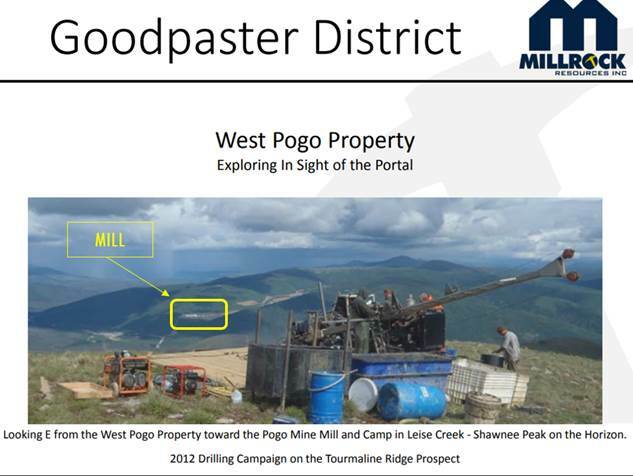 Literally right next to the Pogo mine as photos from our property, you can see the mill, right here and this is for the last drilling campaign by the junior company that had it prior to Millrock. So we are right across the river from Pogo proper. 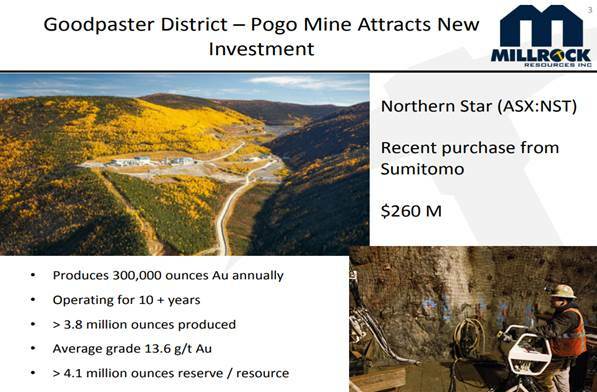 Current exploration on the mine property is getting closer and closer to the Pogo mine, which was very recently purchased from Northern Star at a fair price, but it ended up equaling about $69 an ounce that they had to find already. But it’s been a great asset for Sumitomo and now Northern Star, 12 years of production, nearly 4 million ounces produced and easily another 4 million ounces that they have in their reserve and resource prior to the update that they said they’d be releasing later this year based on their new drilling and the latest press release. So things are really ramping up there. And it’s been a great asset for those two companies. And Northern Star felt very highly of it and some of their promotional material they placed it as the third highest grade mines in North America. And they felt it was the eighth largest gold mine in the United States, based on its production and contained ounces. 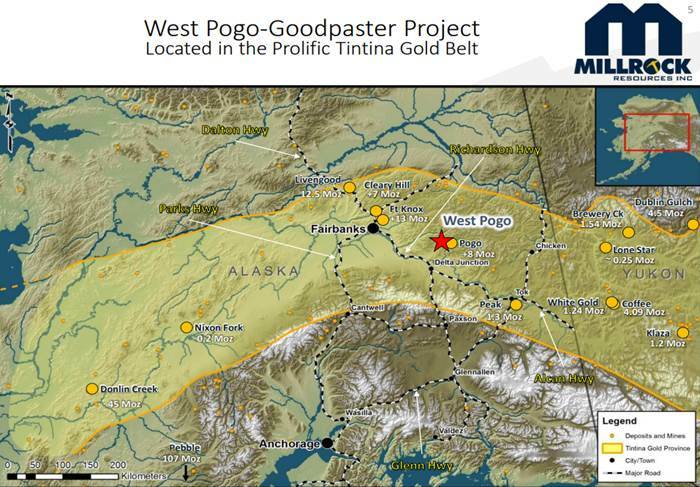 Millrock’s Pogo West is located in Tintina Gold Belt in Alaska, which has some of the more prolific deposits in Alaska right now. 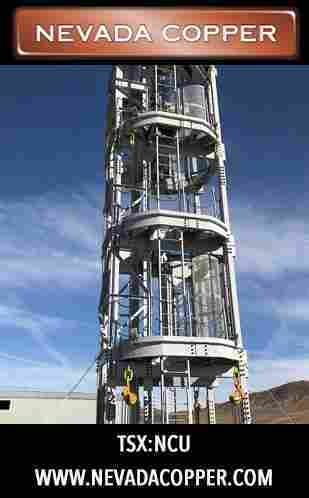 The Pogo mine has about 8 million ounces contained gold. The Mother’s Fort Knox is up at 13 million ounces and, of course, the gargantuan Donlin Creek at 45 million ounces, as well as some smaller deposits that are still being explored heavily in the Yukon that I’m sure you’re aware of there, Coffee and White Gold and Brewery Creek. Maurice Jackson: Chris, can you provide us with some additional context on the geology at the West Pogo Goodpaster region? 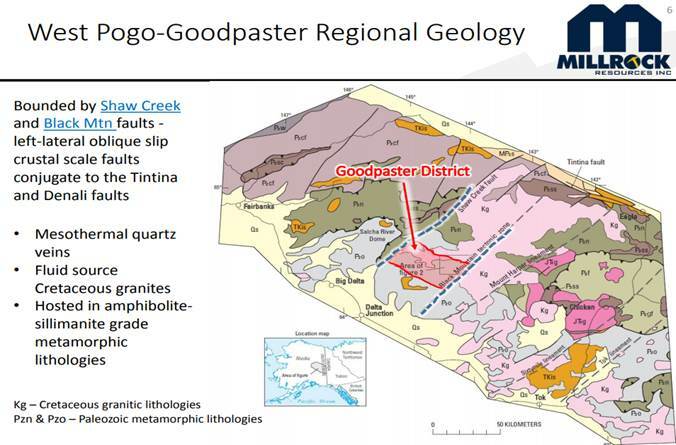 Chris Van T: Geologically, the Goodpaster district, which contains Pogo, is a nice chunk of the crust that’s broken up by a number of very large faults that are all related to the Tintina gold belt faults. And so, the Denali fault would be down here, that’s the southern boundary of the Tintina gold belt and the Tintina fault is up here. And so, it’s in an area of metamorphic rocks that has some very nice granitic intrusions in them, which would be the source of the fluids for the Pogo mine, as well as the other deposits in the district there. Maurice Jackson: Chris, what can you share with us about the existing infrastructure? 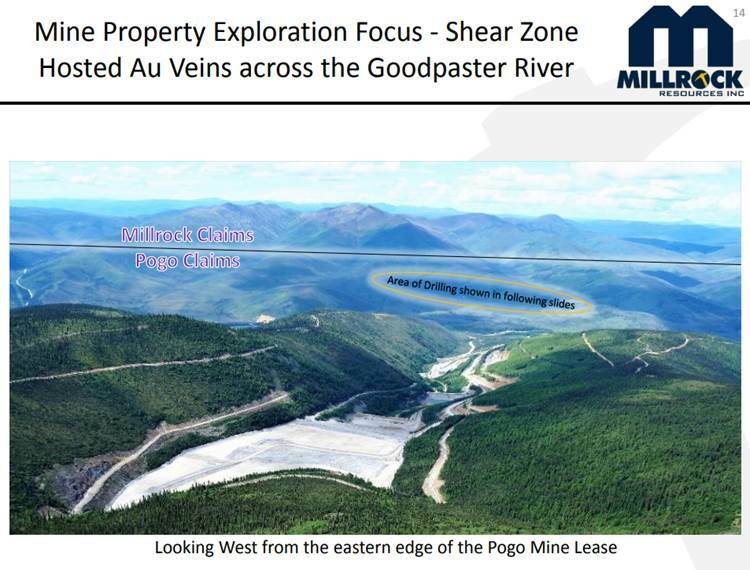 Chris Van T: It’s fantastic access and infrastructure with the Pogo mine road running through the claim block. We have the permit to travel on that road. The nice claim block, which size is 7,500 hectors and, as I mentioned, it’s adjacent to the Pogo mine. 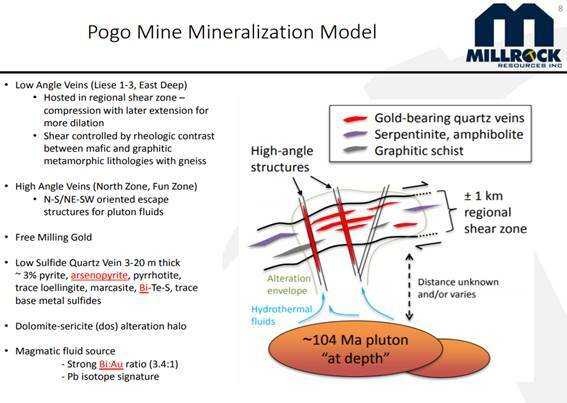 Taking a look at what the Pogo mine looks like in a geologic model, specifically in a schematic cross section. The Pogo mine itself is exploiting and beneficiating low angle quartz veins, as well as high angle veins. So, the theory is that the fluids from the plutons travel up those steep faults and enter into the shallow dipping faults. And that’s where they have the gold veins in both the steep faults in the shallow faults. And there are quartz veins with a small amount of sulfide minerals, arsenopyrite and as well as some bismuth minerals. And so, arsenic and bismuth along with gold are the fantastic pathfinder elements that we have at the surface. Those allow us to look at the soil samples and the rock samples at the surface and try to zone in on where the mineralization would be at depth. The surface features would be these high angle steep faults intercepting the soil profile. These are the projections of the Pogo veins from the subsurface brought up and displayed on the surface. Northern Star Resources are mining these areas: South Pogo, Liese, North Zone and East Theits. There are large faults that break up the rocks and move them around. Looking at this cross section towards the northeast are some high angle steep veins and they’re interpreted mineralized halo. 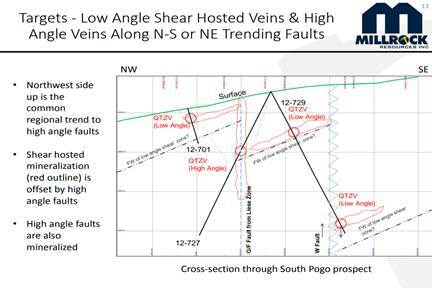 Both these and the shallow dipping faults contain veins that are being mined right now at the Pogo mine. And an important thing to point out on are the steep faults tend to move the northwest side of the fault up relative to the southeast side, which would then bring this mineralization in the low angle faults closer to the surface, and that’s been repeated throughout the district and has a real boon to the Millrock properties. Here’s a picture from the mine and we’re looking down the trace of the mine. The latest exploration on Pogo is across the river and right adjacent to our claim block. In 2017, they made a fantastic discovery of another vein of minable width. And on the other side of the river. The Goodpaster vein had very nice thicknesses and it dips in the same direction of previous veins. Northern Star Resources made this discovery based on reinterpretation of its subsurface imaging that uses a resistivity method called CSAMT, (Controlled Source Audio Magnetotellurics), the image conductive properties of the rocks. The company decided that the break rate here and the conductive properties of the rocks represented the base of a vein and the drilling in 2017 revealed this low angle vein that the 2007 drilling didn’t reach because they didn’t have this reinterpreted imaging. The vein that they intercepted, a low angle vein Quartz gold Arsenopyrite, and it had a very nice minable width of 5.3 meters at 60 grams. So, this is very similar, nearly identical to what was being mined already in the Liese veins South Pogo, east steeps north zone on the eastern side of the river. Now on the western side of the river, they have nearly identical mineralization with the exact same orientation. So they’re very excited that the vein system that they’ve been mining for 12 years exists on the west side of the river. The Fun Zone is this area in here on their plan map, so this would be looking down over the mine. The river is a visible in the satellite imagery from a northeast view, as we look this cross section. Once again, these high angel steep faults bring the northwest western side up. Maurice Jackson: Chris, if I may interrupt you with the shift in the fault zones, how does it benefit Millrock? Chris Van T: It brings the mineralization closer to surface. 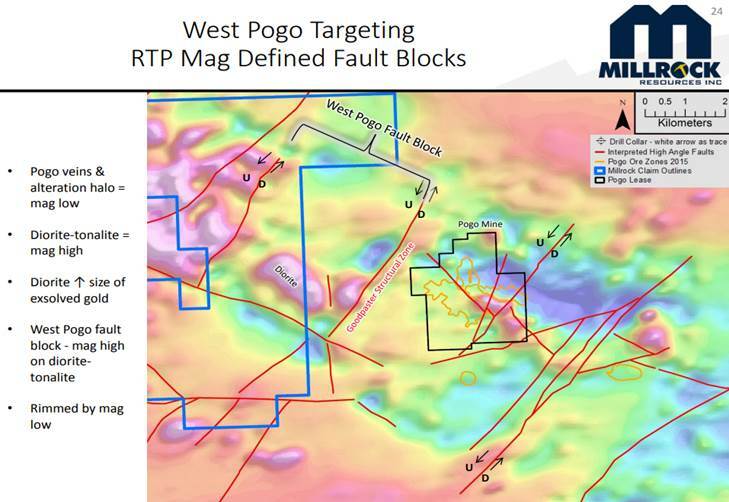 This area here is a big part of their latest press release; Northern Star Resources is calling it the Central Lode System and it feels that it’s a significant extension of both the Liese zone and Fun zone vein sets within the same overall large, mildly dipping faults that contain these veins. And so, this same process that’s bringing things up all throughout the district is that work on the western side of the river adjacent to the Millrock claims. These red lines represent those steep folks that make and bring the northwestern side up relative to the southeastern side. And this red line represents that Goodpaster Structural Zone. 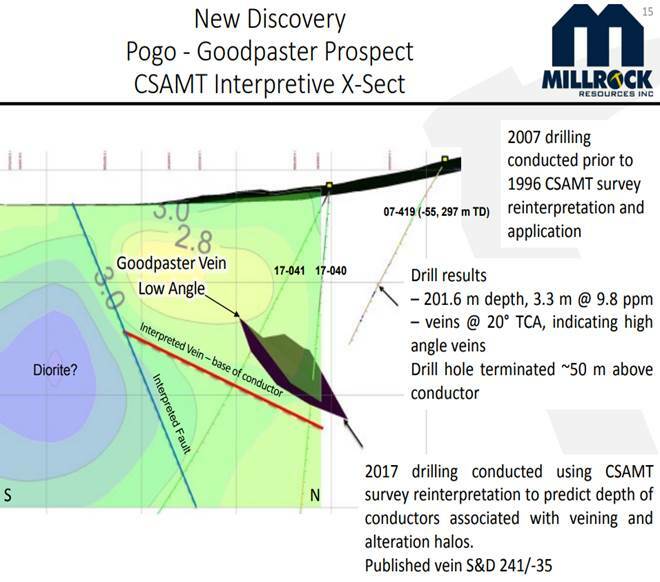 The Goodpaster Prospect that has been explored aggressively by Pogo in the last two years is in between two other of these large steeply dipping faults. And so, it’s a fairly contiguous block and it’s about the same distance between the Goodpaster Structural Zone and the South Pogo Zone. And so, this matches very well geologically with what we would expect to see on these high angle faults. Northern Star Resources claim boundary and the latest exploration road is very close to our claim boundaries within 420 meters of our claim boundary now. Not only at an exploration road but also some of its large drill pads and it is drilling in the area. 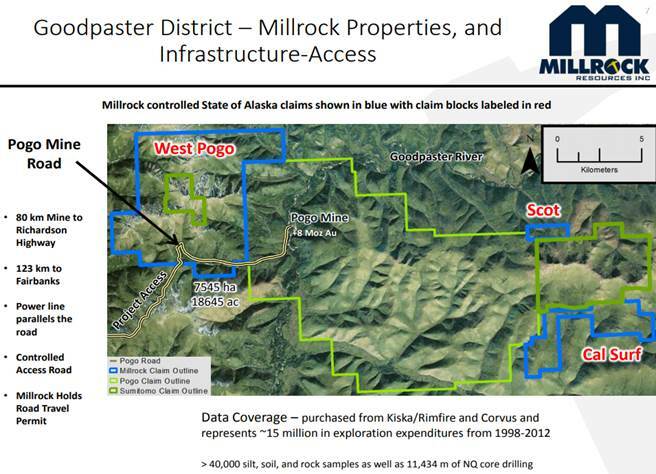 Maurice Jackson: Does Northern Star Resources have any drilling planned this year near Millrock’s claim blocks? Chris Van T: Northern Star Resources are exploring very close. It has got some drill holes planned for this year in the summertime within 90 meters of the claims boundary right here in the north. And so, Pogo is knocking at the door of the Millrock claims of their exploration. Their Central Lode and that’s what was in the press release (click here) that came out Feb. 12. And so, this area right in here is where they have released their new spectacular results and subsequent definition of resource coming this August from the press release. 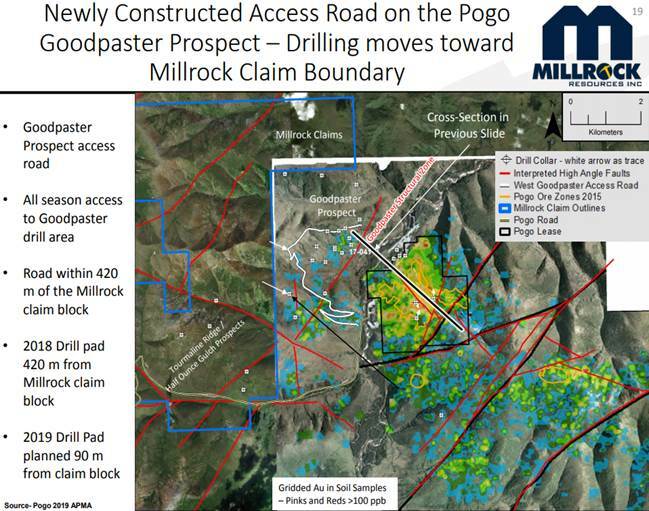 From a real estate standpoint, Millrock is very well placed within what’s going on with the Pogo mine exploration. And we feel that the rest of our geologic knowledge in the area as well as the information purchase from other parties leads me to believe that those veins extend onto the middle rock properties. Maurice Jackson: Northern Star Resources had an active drill program near the Millrock claim blocks last year. Do we know any of the results? And also, do we know what their aspirations are in the area for 2019? Chris Van T: Here are some photos in September of their exploration in that area. Very large drill pads, large rigs drilling, multiple drill holes. Northern Star Resources 2019 planned holes which are to start in February so they could well be underway as we speak. They are drilling off what appears to be a substantial resource of those low angle veins. Once again, just to remind you of 5.3 meters at 60 grams per tonne drilled and released in this area here. No other drill results or any of this drilling has been made public as of yet, but they are getting closer and closer to our claim boundary in this trajectory right here. This is a photo from our claims looking back to the mine and here is that Goodpaster Structural Zone that they’ve named it. And so right now they’ve defined their new Central Lodes would be filling this area basically from their road here to this structural zone where they’ve defined basically a new extension of the mine right up to this fault and they’re getting ready to go and move some headings into there and continue to explore that from underground. So they’re moving mine infrastructure from the Liese zone, right up to this Structural zone. And as I mentioned, the Goodpaster Prospect is just the other side of that and is actually had the veins that are being explored for in the area brought closer to the surface because of the faults and how they always bring the northwestern side up, very close to our claim boundary. Let’s take a look at a magnetic survey image that the state survey ran in 2000. Here are the Pogo veins brought to surface. Note these veins occur outside of this purple magnetic high, within a magnetic low relative to the rest of the area. There are more of these on the other side of this large high angle fault throughout the Millrock claim boundary as well as here in the Goodpaster Prospect. This is the area they’re drilling and right now, predominantly in this magnetic low that’s very similar to what they have on the north side of their mine. They’ve got a diorite within the mine that’s magnetic and there’s one on the Millrock claims that’s magnetic as well with the same magnetic lows surrounding it. So, from a geologic standpoint, these are nearly identical features. 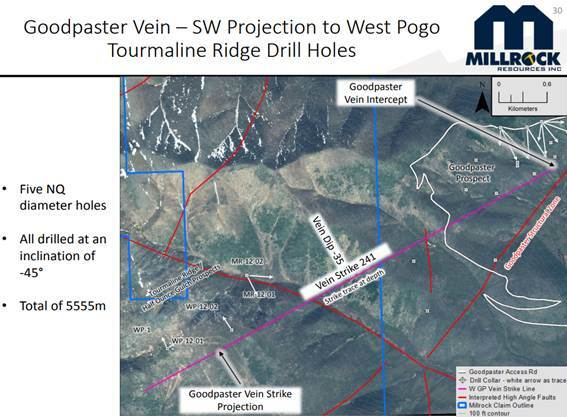 The fact that they’re drilling and this one here as well as this mag lode to the north, lead me to believe that the geologic model at the mine is readily applicable on the other side of that high angle, steep fault called the Goodpaster Structural Zone. So I feel that the Millrock claims are very highly prospective for the extension of the vein. Placing our soil and rock samples on top of the magnetics, they illustrate how in those areas of magnetics, we have great gold samples and they are oriented more or less in a northeast, southwest fashion, which is the same as what’s going on over here on the mine property. They have a northeast southwest orientation to their gold and soil sample. We have the same orientation on our property. These are most likely caused by unmapped equally dipping fault such as this one here, which helps those fluids from the magmatic intrusion at depth, get them to the surface into the soil profile. Arsenic has a coincident anomaly and so does bismuth. And so our pathfinder elements that match the Pogo mineralization of gold in our arsenopyrite with bismuth minerals are all present on the Millrock properties. Maurice Jackson: Let’s add some geometry to the discussion. Chris Van T: This here is the location of that Goodpaster vein, the 5.3 meters at 60 grams. 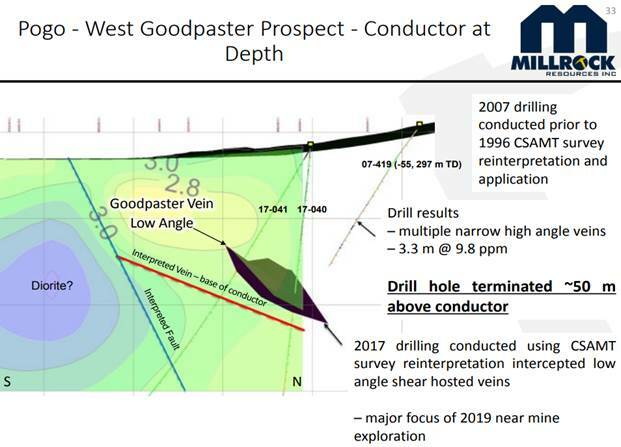 Northern Star Resources has stated the vein was oriented with a strike of 240 degrees and the dip of 35 to the northwest. Plotting that strike line is would be where the vein would be the same elevation all the way across. It brings us very close to past drilling in our area. Past drilling was situated in that area of fantastic gold, soil, and rock anomalies that are all showing the interaction of those steep faults that carried the fluids with the soil. The vein intercepted within these drill holes have been narrow quartz arsenopyrite veins. And the assays returned good arsenic bismuth silver. They have the same style of alteration of Pogo there. And the angles intercept in there would indicate that these veins are steeply dipping. So, exactly along the model lines of the steeply dipping faults springing the fluids up towards the surface. All of those faults have been intercepted in these drill holes. The difference between here and what’s going on at Pogo is that these drill holes did not get deep enough to intersect those shallowly dipping veins such as the hole reflecting 5.3 meters at 60 grams. That’s due to the higher elevation where are these drill holes where collared as well as the dip along the vein. The deepest hole over here at the very end of the hole, only got down to 350 meters above sea level. The vein was intercepted at 230 meters above sea level. So when all things being consistent, this hole ended 120 meters vertically above where we would expect to see the flat and veins. To bring this back into the Pogo model, the exact same thing happened on the Pogo property in 2007. Norther Star Resources drilled and intercepted steeply dipping veins that contain gold, arsenopyrite and bismuth; they did not reach the flat line veins. The hole did not go deep enough. The same thing went on the west Pogo claims. The drilling so far at West Pogo has just gotten into the top of these steeply dipping veins. I believe that the shallow dipping veins are there at depth, that the soil and rock anomalies at the surface coupled with the drilling show that we haven’t reached the depth of those flat veins to date and that a few holes of deeper drilling could readily intersect these veins at the depth and an extension of the mine mineralization on the Millrock Claims. Maurice Jackson: What initiatives will Millrock take to de-risk the West Pogo property? 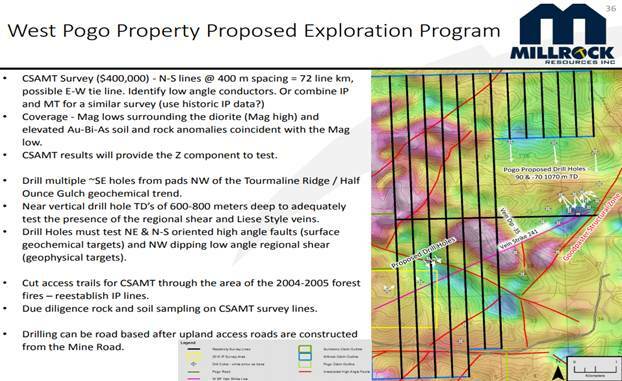 Chris Van T: That would be to do that imaging along these black lines here in order to do the same style imaging, the CSAMT or Resistivity imaging over this mag low that also has the good gold and rock samples on top of it. That would be one way to de-risk it. 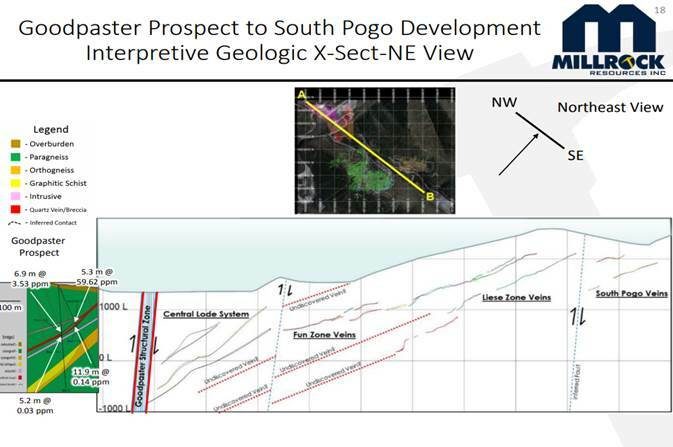 In order to know the depth you need to drill to in order to find the extension of this mineralization that’s on the Pogo claims. 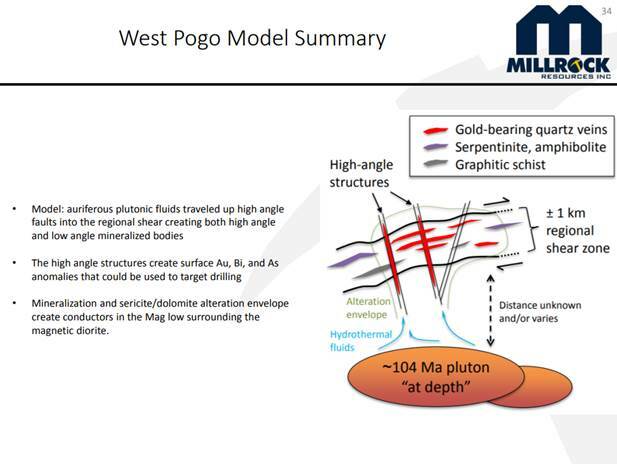 Millrock believes that the West Pogo property has not been explored properly to depth. It’s got the exact same magnetic signature as the mine proper. 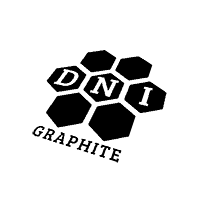 The surface geochemistry and the drill hole geochemistry have all the attributes to indicate that mine style mineralization is located on the property. Northern Star Resources is currently exploring, right against our claim boundary and we’ve got established access with the mine road running right through the property. And so very positive factors for the West Pogo property. Maurice Jackson: Gregory, this may be premature, but should we continue to have favorable outcomes such as this press release? How does this impact Millrock’s strategy? Gregory B: Well, I think one of the more remarkable things about the statements from Northern Star is the exceptional grade of the drilling intersections that they’ve discovered at this Central Lode’s area. And we’re pretty sure they’re finding similar things at their new Goodpaster discovery, which is very close to Millrock’s West Pogo project. 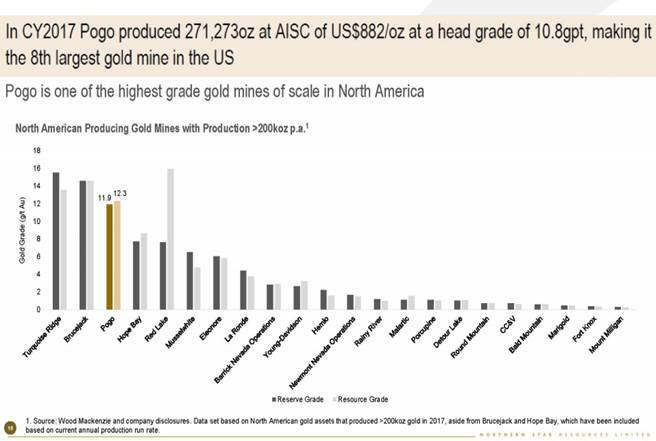 If an ore body of that grade does trend right onto Millrock’s claims, I think it’s going to make a tremendous difference in the price of Millrock stock. We’re trading today around 10 cents Canadian. And I think, just fortuitously, if that deposit comes onto our claims, it’s going to make a big difference for our company and for our shareholders. We have stuck rigorously to our business model over the 12 years we’ve be in the operation. We’ve always got a partner on a project before it got to the drilling stage. Right now, we’re faced with the possibility that our neighbor, Northern Star at Pogo, has discovered an ore body that comes right on to our claims. And so, we might take a different view at this point since we presently have not made an agreement on the claims and we own it 100%. So, it’s possible that we would actually pursue this claim ourselves, but it’s not determined yet. And in fact, right now our best strategy is to wait and see what Northern Star has discovered. Eventually they’ll tell us more about their Goodpaster discovery. What they announced on Feb. 12 was really interesting. I think they’re going to make a fortune from their purchase of the Pogo mine. They’re great miners and great explorers clearly. And they’ve had some great success of finding the new Central Lode’s area, but we know there’s more, further to the northwest and there’s likely to be gold on our claims too. So our strategy for now is to stand pat and a wait for more information, which is not our usual way of doing things. Usually we’re charging ahead full steam, but we’re at now we’re going to bide our time and watch, wait and see what happens. Maurice Jackson: Germane to this discussion, how do the prices of gold, silver, copper and uranium fit into this narrative? Gregory B: Well, certainly Millrock has exposure to all of these metals. I know that the price of gold seems to have a large effect on availability of capital for junior explorers. When the price of gold is strong, there’s lots of capital available. It doesn’t matter if you’re looking for copper, it often seems to have a lot to do with the price of gold. Millrock has seen good increase in the gold price lately. Everything I’m reading says that gold’s going to march up even higher and silver we’ll go with it. I hope they’re all right about that. And that will soon have a really favorable market in the coming years for those metals. Longer term, I’m a huge believer in copper. I just know it’s going to be a metal in huge demand and we’re happy to be looking for copper now too, for the future. And a uranium, well, it’s a beaten a down cycle a long time, but I’ve sure seen some active of bull markets in that metal over the years. And if there’s another one coming, Millrock and its shareholders are really going to benefit by virtue of the uranium deposit we own in New Mexico. Maurice Jackson: Switching gears, Gregory, what do you see as the biggest challenge for Millrock resources and how do you mitigate that situation? Gregory B: Our biggest challenge is a financing. We’re in a short cash position. How do we mitigate that? Well, the best way we can do it is to get more funding partners on our projects. And so we’re on a real push to get that done right now. We’ve got deals that look like they’re imminent in Sonora and Alaska. So that’s the best way. Ultimately we may have to raise funds through an equity financing again soon. So those are Millrock’s challenges right now, but I think there’s good solutions for them. Millrock presently has a pretty low share account all of which was in quite solid hands. There’s 67 million shares outstanding at present. Gregory B: Well, I don’t know if it’s something you forgot to ask, Maurice, but maybe something I forgot to mention. Millrock had acquired several great properties in British Columbia some years ago, and last year we rolled them all into a new company called Sojourn Exploration and found a great management team for that company. 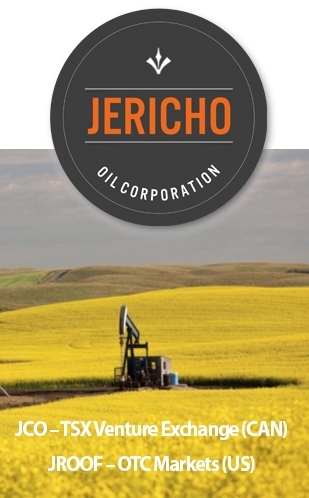 It has its own projects and so Millrock’s is a big shareholder of Sojourn Exploration. Those shares are worth the money right now, which helps Millrock shareholders, and we own royalties on three of those projects. So, we’ve reviewed internally what’s Sojourn all those projects recently and that it’s just a great portfolio and I know that team is going to have great success attracting other companies to fund drilling on them and make discoveries. So, this could be a real winner for Millrock and its shareholders. Maurice Jackson: Mr. Beischer, for someone listening that wants to get more information on Millrock Resources, please share the contact details. Gregory B: millrockresources.com and Melanee Henderson at 604-638-3164, in charge of investor relations, will be glad to talk to you or put the shareholders in direct touch with me. Maurice Jackson: And as a reminder, Millrock Resources trades on the TSX.V, symbol MRO. Now, in the OTCQX, symbol, MLRKF. 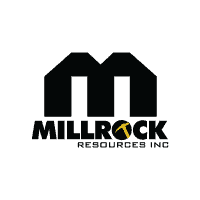 Millrock Resources is a sponsor of Proven and Probable and we are proud shareholders of Millrock Resources for the virtues conveyed in today’s message. And last but not least, please visit our website, provenandprobable.com, where we deliver mining insights and bullion sales. 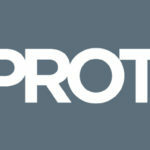 You may reach us at contact@provenandprobable.com. Gregory Beischer and Chris Van Treeck of Millrock Resources, thank you for joining us today on Proven and Probable. 1) Gregory Beischer: I, or members of my immediate household or family, own shares of the following companies mentioned in this article: Millrock Resources. I personally am, or members of my immediate household or family are, paid by the following companies mentioned in this article: Millrock Resources. 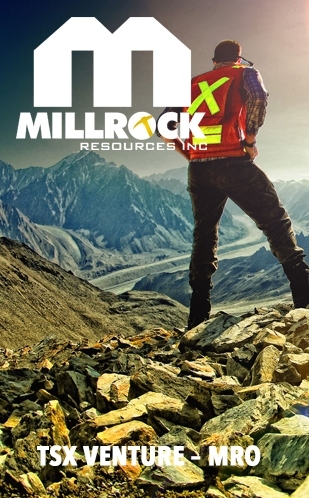 2) Maurice Jackson: I, or members of my immediate household or family, own shares of the following companies mentioned in this article: Millrock Resources. I personally am, or members of my immediate household or family are, paid by the following companies mentioned in this article: None. My company has a financial relationship with the following companies mentioned in this article: Millrock Resources is a sponsor of Proven and Probable. Proven and Probable disclosures are listed below. 6) From time to time, Streetwise Reports LLC and its directors, officers, employees or members of their families, as well as persons interviewed for articles and interviews on the site, may have a long or short position in securities mentioned. Directors, officers, employees or members of their immediate families are prohibited from making purchases and/or sales of those securities in the open market or otherwise from the time of the interview or the decision to write an article until three business days after the publication of the interview or article. The foregoing prohibition does not apply to articles that in substance only restate previously published company releases. As of the date of this article, officers and/or employees of Streetwise Reports LLC (including members of their household) own securities of Millrock Resources, a company mentioned in this article. This entry was posted in Base Metals, Exclusive Interviews, Junior Mining, Precious Metals, Project Generators on February 21, 2019 by admin. 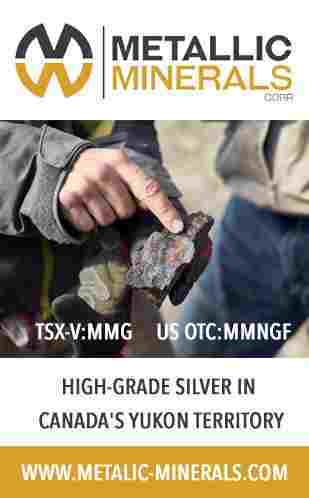 Vancouver, British Columbia–(Newsfile Corp. – February 19, 2019) – EMX Royalty Corporation (TSXV: EMX) (NYSE American: EMX) (“EMX” or the “Company”) is pleased to announce it has received 4,808,770 common shares of Norra Metals Corp. (“Norra”) (TSXV: NORA), representing a 9.9% equity stake in Norra. EMX acquired the shares pursuant to the sale of the Bleikvassli, Sagvoll and Meråker polymetallic projects in Norway, and the Bastuträsk volcanogenic massive sulfide (“VMS”) project in Sweden (the “Projects”), as announced in the Company’s news release dated December 13, 2018. EMX will retain a 3% net smelter return (“NSR”) royalty on the Projects, as well as other consideration to the Company’s benefit. 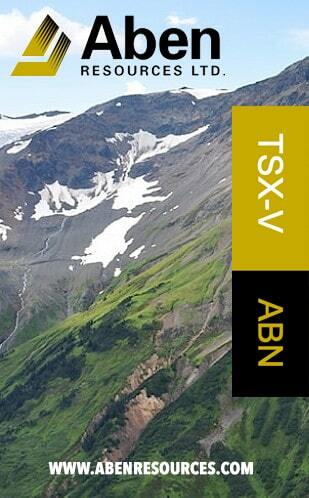 EMX has also been granted a 1% NSR royalty on Norra’s Pyramid project in British Columbia. 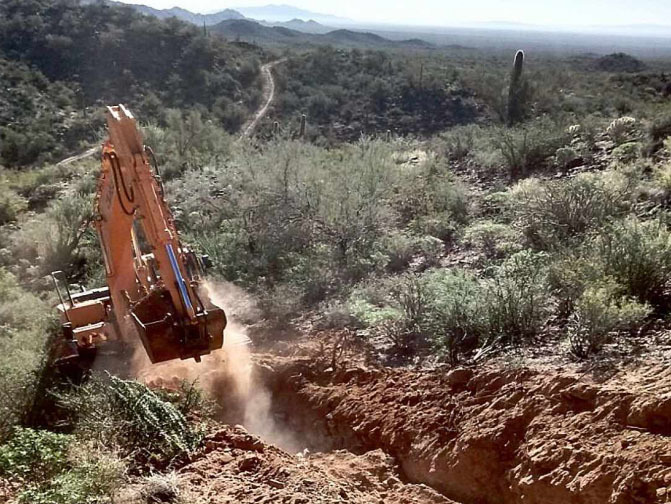 The TSX Venture Exchange has approved the details of the transaction and transfer of the Projects from EMX to Norra, subject to customary final filings. 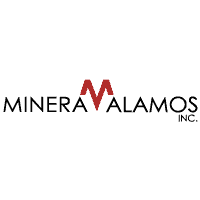 Norra Metals Corp. (previously OK2 Minerals Corp.) is a Vancouver-based exploration company with two projects in British Columbia’s “Golden Triangle”, as well as the four Scandinavian Projects acquired by Norra from EMX. Norra’s management team has considerable experience working in Scandinavia from previous ventures, and EMX will work closely with Norra to ensure timely advancement of the Projects in Scandinavia. Norra and EMX are in the process of obtaining work plan permits for the Projects, and expect exploration work will commence in early spring. This entry was posted in Base Metals, Energy, Junior Mining, Precious Metals, Project Generators on February 19, 2019 by admin. 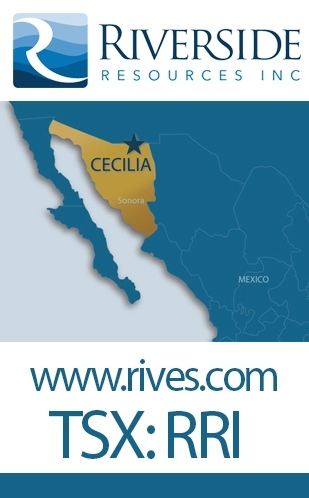 VANCOUVER, British Columbia, Feb. 19, 2019 (GLOBE NEWSWIRE) — Riverside Resources Inc. (“Riverside” or the “Company”) (TSX-V: RRI) (RVSDF) (R99.F), is pleased to announce that partner Sinaloa Resources Inc. has entered into a Definitive Agreement (the “Agreement”) signed on January 30, 2019 that begins with an Initial Option to acquire a 70% interest in the La Silla Project (the “Project”). Sinaloa Resources has issued Riverside 1,000,000 common shares and now paid $60,000 total in cash. Riverside and Sinaloa Resources expect the commencement of a first phase $300,000 exploration program in the coming months, as per the Agreement (see Table 1 below). 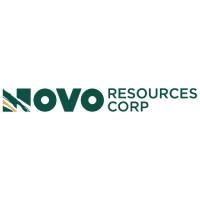 Under the terms of the Agreement, the Initial Option to earn 70% is predicated upon the issuance by Sinaloa Resources of shares at a value of $1,000,000, $60,000 in cash payments and exploration work totaling $2,000,000 over 36 months (see Table 1 below). 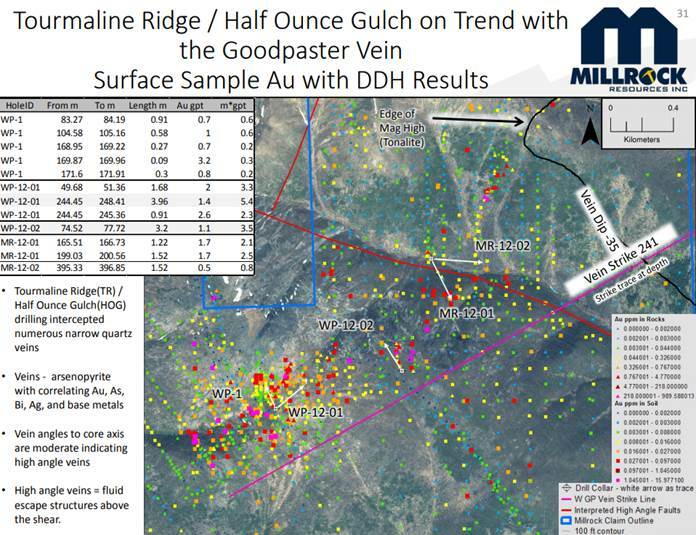 Riverside has completed extensive generative prospecting work at the Project including rock-chip and grab samples up to 19.9 g/t Au and 200 g/t Ag. 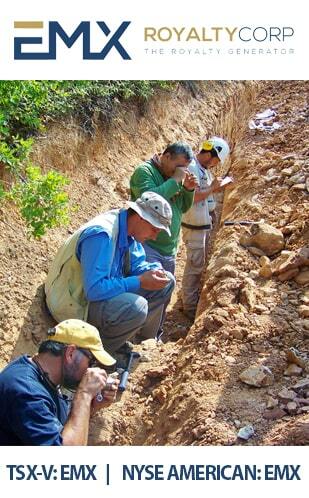 Riverside’s previous work programs focused on extending known areas of mineralization, such as the Ciruelo and El Roble veins (see press release June 19, 2018). Further property-wide exploration also successfully identified new showings, structures and historical abandoned workings as part of the Company’s generative work aimed at developing additional exploration target areas to increase the pipeline of new discovery targets at La Silla. 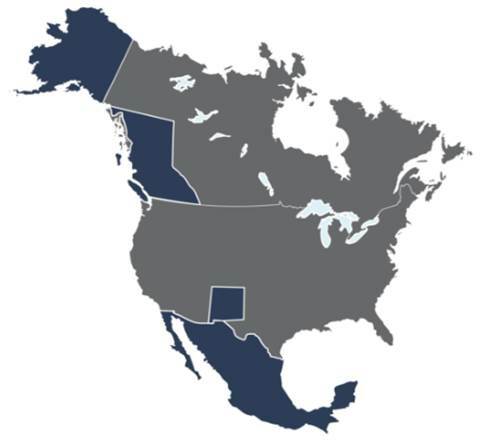 Sinaloa Resources is currently a privately held company and intends to pursue a listing transaction on either the TSX Venture Exchange (“TSXV”) or the Canadian Securities Exchange (“CSE”) within 12 months of execution of the Definitive Agreement. The Agreement also includes several provisions that protect Riverside in the event of early termination or a late listing transaction. To earn an additional 30% (the “Additional Option”), Sinaloa Resources must incur a further $1,000,000 in exploration work and issue Riverside additional Sinaloa Resources shares at a value of $500,000. Riverside will retain a 3% NSR on the Project should Sinaloa Resources complete 100% earn-in, or Riverside’s interest dilutes to less than 10%. The scientific and technical data contained in this news release pertaining to the La Silla Project was reviewed and approved by Freeman Smith, P.Geo, a non-independent qualified person to Riverside Resources, who is responsible for ensuring that the geologic information provided in this news release is accurate and who acts as a “qualified person” under National Instrument 43-101 Standards of Disclosure for Mineral Projects. Certain statements in this press release may be considered forward-looking information. These statements can be identified by the use of forward looking terminology (e.g., “expect”,” estimates”, “intends”, “anticipates”, “believes”, “plans”). Such information involves known and unknown risks — including the availability of funds, the results of financing and exploration activities, the interpretation of exploration results and other geological data, or unanticipated costs and expenses and other risks identified by Riverside in its public securities filings that may cause actual events to differ materially from current expectations. Readers are cautioned not to place undue reliance on these forward-looking statements, which speak only as of the date of this press release. 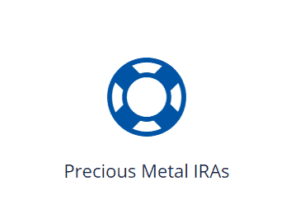 This entry was posted in Base Metals, Junior Mining, Precious Metals, Project Generators on February 19, 2019 by admin. KELOWNA, BC , Feb. 14, 2019 /CNW/ – FISSION 3.0 CORP. (“Fission 3” or “the Company“) is pleased to announce results from the winter drill program at its PLN project in the Athabasca Basin region of Saskatchewan, Canada . A total of 2,051m were drilled in six completed holes and two holes that were abandoned due to poor ground conditions. Drilling focused on the north-south trending A1 basement hosted electromagnetic “EM” conductor, where previous drilling in 2014, including hole PLN14-019 ( 6.0m @ 0.012% U3O8), indicated the conductive corridor to be prospective for mineralization. All six holes encountered strong hydrothermal alteration over variable widths and a number of narrow radiometric anomalies, including a downhole radiometric peak of 1,382cps (PLN19-026), often a key signature of mineralized systems. The A1 conductive corridor remains prospective to the south and PLN hosts multiple drill targets that remain untested on the property, and will be the subject of future exploration. New Drill Program Imminent. The company is prepping for a nine-hole work program at two of its Key Lake South projects – Karpinka Lake and Hobo Lake – which is expected to commence imminently. The Key Lake South projects are located approximately 40km south of the historic Key Lake mine and mill. 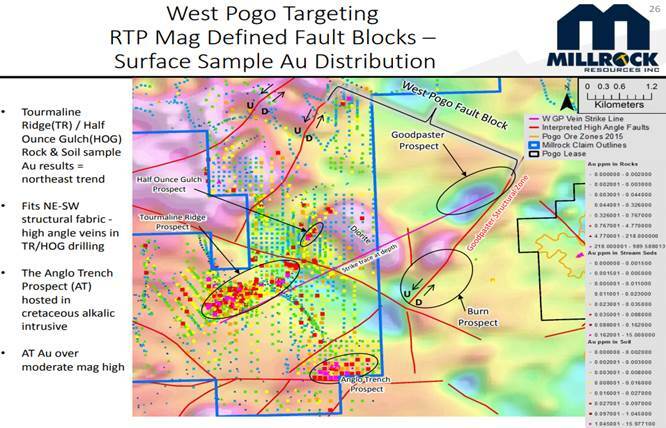 In a setting analogous to Fission Uranium’s PLS project, the target is shallow depth, basement hosted uranium mineralization outside of the present day Athabasca Basin margin. The Key Lake Shear Zone (KLSZ) is a north-south trending, moderately meandering litho-structural corridor that is present north of the Key Lake deposit and continues to the south, through the Karpinka and Hobo Lake properties. The KLSZ is a primary feature associated with the occurrence of the historic Key Lake deposit and its presence on the Key Lake South properties represents an important exploration target. The property, just inside the Athabasca Basin, is prospective for high-grade uranium at shallow depth. The property is adjacent to, and part of the same structural corridor as Fission Uranium’s PLS project, host to the Athabasca’s most significant major, shallow-depth, high-grade uranium deposit. Previous drill results show large scale potential. Drilling in 2014 identified a mineralized corridor associated with the A1 ~700m in strike length, where results returned significant mineralization and pathfinder elements (uranium, boron, copper, nickel and zinc) and included hole PLN14-019 which intercepted 0.5m at 0.047% U3O8 within 6.0m @ 0.012% U3O8. PLN19-022 was an angled hole designed to test the up-dip extension of anomalous shear hosted radioactivity intersected in PLN14-019 ( 6.0m averaging 0.012 % U3O8). The drill hole intersected moderately bleached and fractured Athabasca sandstone from a depth of 115.6m to 135.0m , underlain by a thick sequence of variably hematite, clay and chlorite altered granite, granitic gneiss, mafic intrusive and pegmatite. A thin brittle-ductile shear zone was intersected from 177.7m to 185.5m with elevated radioactivity occurring between 180.0m to 180.5m up to 300 counts per second (cps) on a RS-121 handheld scintillometer. Fresh basement rocks were intersected at a depth of approximately 240m to a final depth of 290.0m . PLN19- 023B was an angled drill hole collared 30m grid north of PLN14-019, targeting PLN14-019 anomalous shear hosted radioactivity along strike. The first and second attempts to test this target, drill holes PLN19-023 and PLN19-023A, respectively, were both lost shortly after reaching bedrock due to poor ground conditions. PLN19- 023B cored Athabasca sandstone from 114.8m to 127.9m underlain by a sequence of variably altered granite, granitic gneiss and mafic intrusives. Millimeter scale black radioactive blebs were identified in strongly hematized basement rock around 139m down hole, returning up to 210 cps on a RS-121 scintillometer. A thin brittle-ductile shear zone was intersected from 188.2m to 193.7m but was not radioactive. Fresh basement rocks were intersected at a depth of approximately 244m to a final depth of 354.8m . PLN19-024 was an angled drill hole collared 30m grid south of PLN14-019 targeting the anomalous shear hosted radioactivity along strike. Strongly fractured, locally bleached and hematized Athabasca sandstone was intersected from 111.5m to 119.0m . The Athabasca sandstone was underlain by variably altered granite, orthogneiss and mafic intrusives with a strongly clay altered graphitic mylonite occurring between 201.2m to 224.3m . No anomalous radioactivity was intersected and the hole was terminated in fresh basement at a depth of 266.0m . PLN19-025 was an angled drill hole collared 30m grid south of PLN19-024. The hole was designed to further test the strongly altered graphitic mylonite along strike. A thin lens of Athabasca sandstone was intersected from 118.8m to 119.0m which was underlain by variably clay, chlorite and hematite altered granite, orthogneiss, mafic intrusives and pegmatite. A thick graphite and sulphide-rich shear zone was intersected from 193.8m to 211.8m with weak hydrothermal alteration present throughout. The hole was terminated in fresh basement at a depth of 299.0m . PLN19-026 was an angled drill hole collared 80m grid west of PLN19-024 and targeted the down dip projection of the strongly altered graphitic shear zone, testing for basement hosted uranium mineralization at depth. Athabasca sandstone was intersected from a depth of 108.5m to 125.3m , underlain by weakly hematite, chlorite and clay altered granitic gneiss, mafic intrusives and granites. A weakly altered graphitic mylonite was intersected from 259.2m to 268.0m , with an associated radiometric peak of 1328 cps ( 162.8m to 163.2m ). The hole was terminated in fresh bedrock at a final depth of 353.0m . PLN19-027 was drilled approximately 1 km grid south of PLN14-019 and tested the up-dip projection of a graphitic shear zone intersected in drill holes PLN14-011 and PLN14-012 where a coincident north-south trending magnetic low is present. Athabasca sandstone was intersected from 111.5m to 113.4m , underlain by weak to moderately altered granite and orthogneiss to a depth of 190.0m where the drill hole was lost due to poor ground conditions. No anomalous radioactivity was intersected. Samples from the drill core are split in half sections on site. Where possible, samples are standardized at 0.5m down-hole intervals. One-half of the split sample will be sent to SRC Geoanalytical Laboratories (an SCC ISO/IEC 17025: 2005 Accredited Facility) in Saskatoon, SK . Analysis will include a 63 element ICP-OES, and boron. 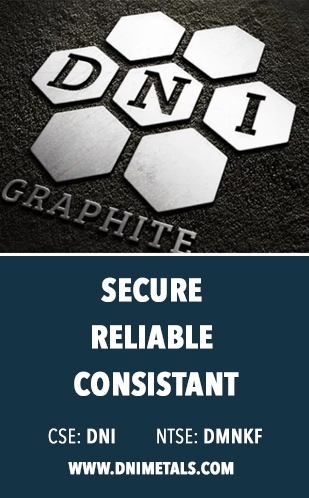 The technical information in this news release has been prepared in accordance with the Canadian regulatory requirements set out in National Instrument 43-101 and reviewed on behalf of the company by Ross McElroy , P.Geol. Chief Geologist and COO for Fission 3.0 Corp., a qualified person. This entry was posted in Base Metals, Blog, Energy, Project Generators on February 14, 2019 by admin.